I now present our tidings of the week. Whence go our students when their learning’s done? And should they learn for free beyond year one? For pupils all, keen learning warrants tweaks. For some the costs are simple—clear as Greek. Others ask how learning’s news is run. And counter claims of inward-looking spaces. Your way of welding words to form a mold. How else to share a new G.W. letter? Or landscape alphabets to see, behold! To free themselves, and ‘gainst all odds, they won. Yourself with glee at Mather’s ratings—fun! Oxen deaths made children woebegone. In asking how the founders got it on. Apologies. This month can make one MAD. 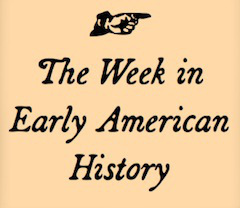 « Just How Free Was Religious Life in the Early American Republic?